Do you have a special occasion coming up? – A wedding, birthday party or hot date with the office stud? With hands used more than any other part of our body to convey messages – from hand shaking, gesturing and waving, our hands act as an unconscious form of communication. Therefore, the condition of their nails are one of the first thing we notice when we meet someone new. With this in mind, it’s no wonder that nails form such an important part of the grooming process. 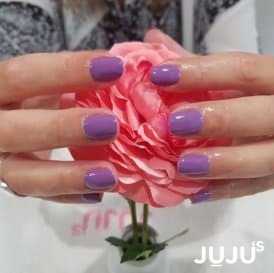 At JUJU’s beauty salon we have a team of highly trained nail technicians ready to pamper you with a combination of superior manicures, pedicures and nail treatments in Camden. Whether it’s a customised manicure or pedicure, hard gel and acrylic extensions or a relaxing massage. With our high quality products and impeccable standards, your nails will grow stronger and look better than ever. As with all of our treatments, you will be offered a free consultation with one of our highly trained nail technicians. Based on the condition of your nails, your lifestyle and your personal requirements, the nail technician will advise on the most suitable options. How Much do Nail Treatments Cost? 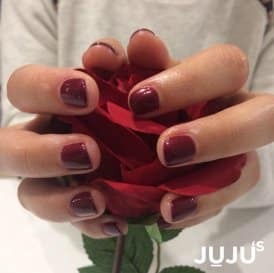 You can view JUJU’s manicure and pedicure prices here. During one of our customised manicures, your nails are given a range of different therapies from cutting and shaping. With a relaxing massage and high quality polish and shine, your nails will look and feel fantastic! Deeply nourishing foot soaks and removal of hard skin, followed by a gentle massage and a high quality polish are just a few of the pedicure treatments that we offer. This deeply relaxing treatment tidies up the feet and leaves on top of the world. 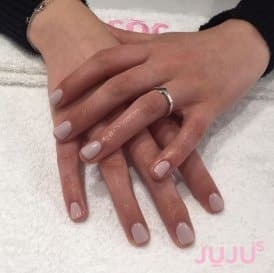 To book a nail consultation and appointment with our highly trained nail technicians contact JUJU’s beauty salon or call 02072678787 to speak to our friendly salon receptionist. Walk in appointments at our nail bar in Camden on Parkway are also possible, but we always advise checking in with us by phone for best chances of success!